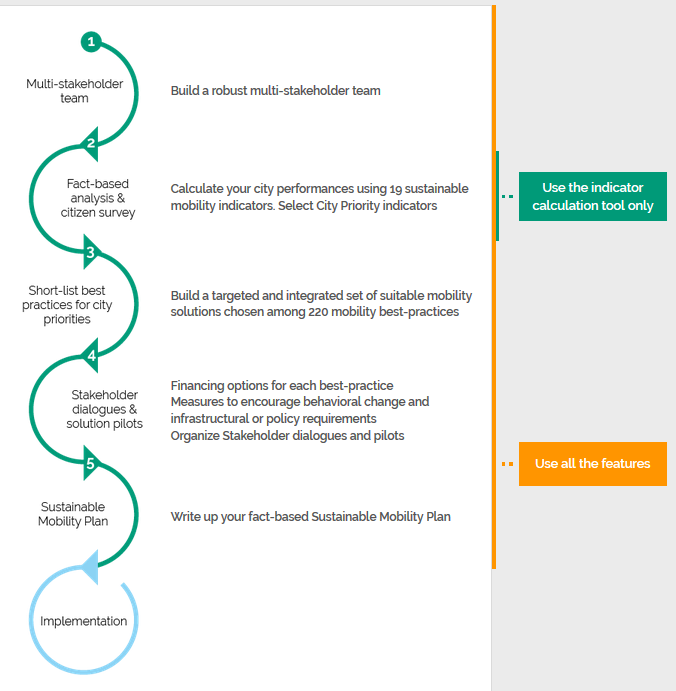 Through a set of 19 sustainable mobility indicators, this tool supports cities in their efforts to develop fact-based and integrated sustainable urban mobility plans. The indicators also provide cities with a means of assessing their own performance in relation to sustainable mobility. The tool can be applied in any geographic area. Its database of 220 mobility best practice examples enables cities to devise their own tailored set of proven sustainable mobility solutions. It also examines possible mechanisms for financing those measures, as well as different campaigns for encouraging transport-related behavioural change and the use of sustainable modes. In addition, it also gives users information on the infrastructural and policy requirements for the implementation of the solutions. Once measures have been selected, users can place them on an online map of their city. This enables cities to visualise how their mobility solutions might eventually be applied in their real urban context. Cities who undertake all of the steps within the planning tool receive a report at the end. This report can be downloaded as a PDF and disseminated to stakeholders. It is important to note that before being able to use both the Indicator Platform and the Planning Tool, cities have to download, sign, and then upload a "Condition of Use" document. They can be found below. To create an account and find out more information about the tool, click here. To watch a video introducing the tool, visit wbcsdsmp.org.